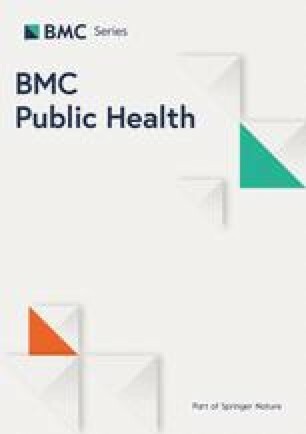 The online version of this article (doi: 10.1186/1471-2458-13-333) contains supplementary material, which is available to authorized users. 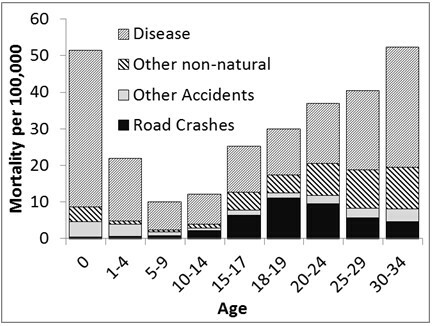 Worldwide, road injuries are a leading cause of death among teens, 10 to 17 years of age. The actual rates, however, differ greatly among countries . One of the factors known to influence these rates is the age at which youngsters are legally allowed to drive a car. Countries that license late, that is from age 18 onwards, have generally better safety records than countries that license early, that is between ages 14 and 17 (see  for an overview). Whereas a wide range of studies has addressed the road risk of 14 to 17 year olds as car drivers, little is known about the road safety of pre-license teens between 10 to 17 of age –who, in late licensing countries, are still too young to legally hold a driving license. 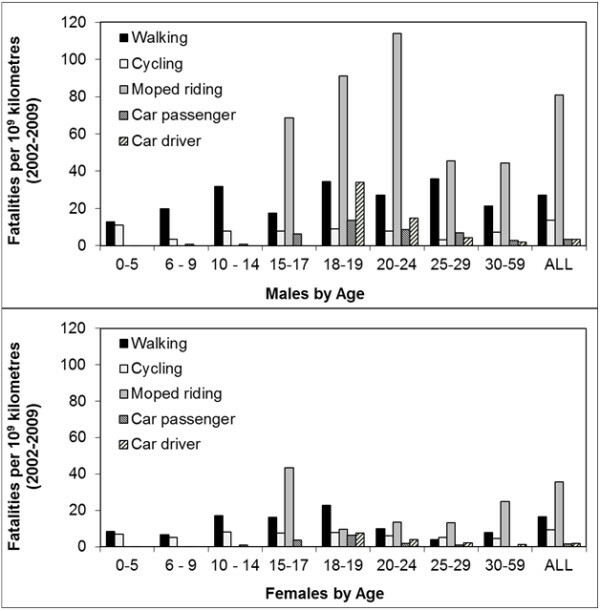 Although this group is not yet exposed to the high risk of car driving, the characteristic psychological and social development associated with the onset of adolescence may have a considerable influence on mobility patterns. 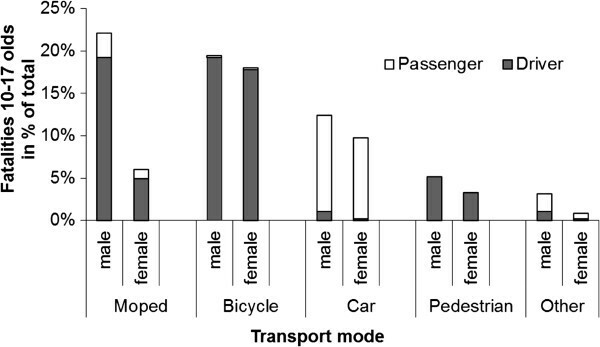 Among the many factors that affect road safety levels, changes in mobility patterns are known to be one of the most influential [3, 4, 5]. 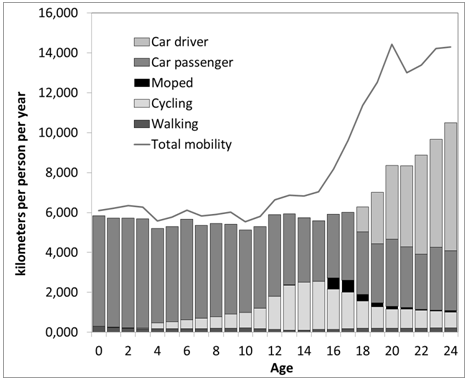 Yet to date, studies on 10 to 17 year olds tend to focus on general themes such as deliberate risk taking and peer group influences (e.g., [6, 7]), but seldom the development of mobility patterns by age and subsequent influences on road safety (e.g., ). To study these relationships and assess the implications for prevention strategies, the present study analyses the development of mobility patterns and road mortality by age among pre-license teens −10 to 17 year of age - in the Netherlands, where car drivers are licenced at age 18, and riders of mopeds and light-mopeds at 16. Mopeds and light-mopeds are powered two wheelers, with a maximum displacement of 50 cc for internal combustion engines and 4Kw for electric engines. Mopeds and light-mopeds differ in terms of their legal maximum speeds, which is 45 km/h for mopeds and 25 km/h for light-mopeds. Helmet wearing and holding a license are compulsory requirements only for mopeds, not light-mopeds.